I’ve decided to document my Group A style dash build. Maybe something here will inspire someone or provide some tidbit of info that helps someone else out one day. I say Group A style because I intend to assemble a dash that has the same basic layout, not something that is historically accurate. 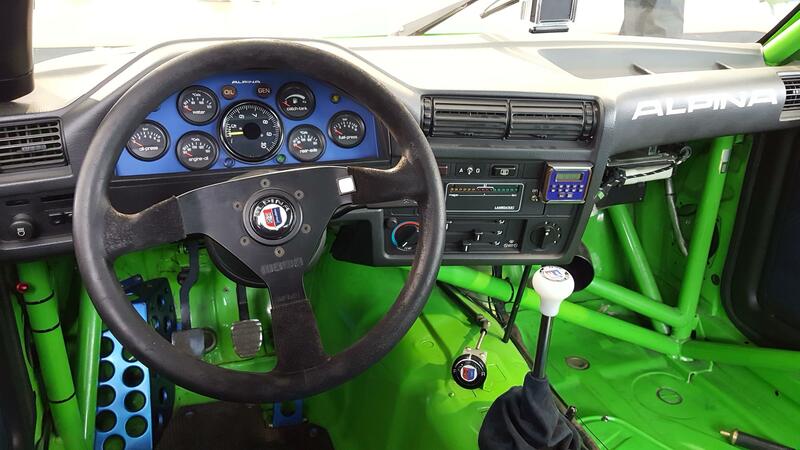 Years ago, I disconnected the factory oil and water temp gauges and installed a series of dial gauges in place of my center dash vent to replace them. They work and are at an equal line of sight to the instrument cluster (I hate looking down to see a gauge). Like the stock gauges, they do nothing more than indicate a reading from a sensor with no monitoring capability. I like the ability to view the data they provide, but if something were to go out of normal range due to some sort of issue, the odds of seeing the problem as it unfolds are pretty slim without a warning system. I’ve looked at digital dashes with warning monitors over the years and I like the all in one source of information, but they always seemed busy to me and I really don’t like watching digital readouts for everything. Dial gauges are much easier for me to glance at and see if something isn’t where it’s supposed to be. Back when I originally installed the aftermarket gauges, there wasn’t much on the market with monitoring capability except the digital dashes. Since then, several programmable dial gauge lines have come to market. They give me the ease of readability that a dial offers and the ability to monitor/annunciate problems when they arise. My goal is to put all the gauges/annunciators in place of the stock instrument cluster and remove the gauges from my center air vent. The basic design will include six 52mm gauges and a single 80mm gauge along with lights to replace the necessary dash annunciations. There will be no OBC or Check Control carried into this dash. My Check Control panel has been disconnected for years and I only use the clock/temp functions on the OBC. Cruise control will likely be deleted as well. 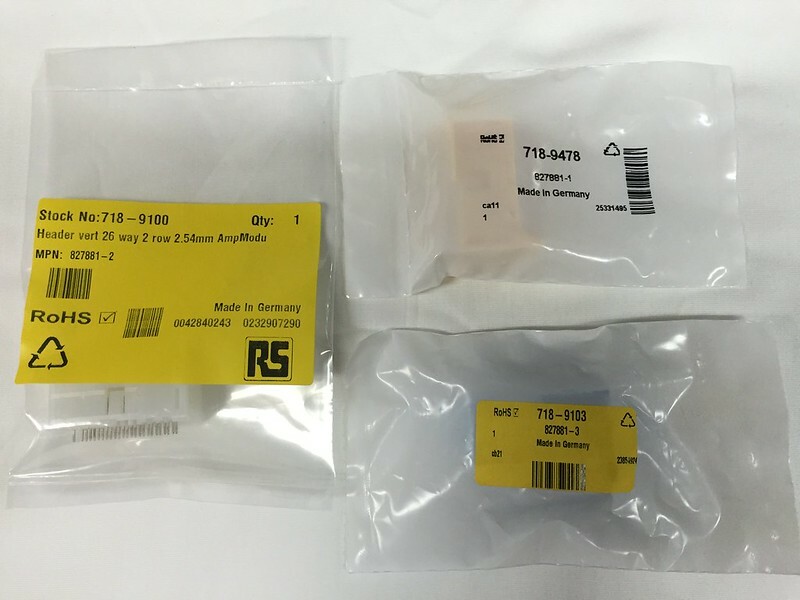 I’ll post information on my component selections as I get the parts in hand. Don’t look for this thread to be updated daily, weekly or even monthly. My only deadline is to have something working by May 2017 so I can make my annual trek to The Vintage in NC. I’ll update this thread as I obtain parts, put things together and search for guidance in problem solving. To maintain continuity for future searches, I’ll tie these other threads I started to this one. Thank you Lee but the first part of my project has already arrived, which is also probably the single most difficult part if I was truly starting from scratch. 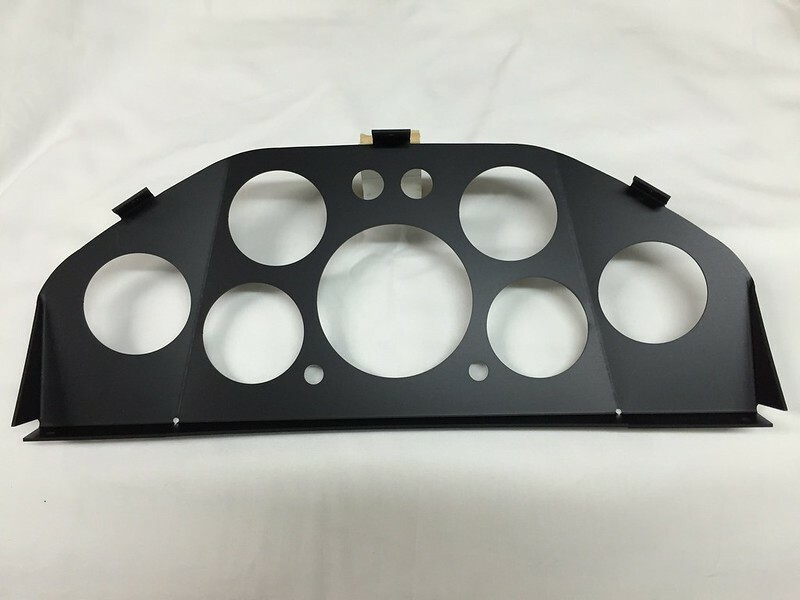 I sourced a replica Group A dash panel from Conrad Timms of M3 Motorsport in New Zealand (http://www.m3motorsport.co.nz/). He has several versions, but the one I was interested in has the 6x52mm gauges along with a black anodized finish. I will utilize the existing warning light holes and add additional ones as necessary. Since I will be disconnecting the OBC, I figured there was no reason to leave it dead in the dash. I thought about putting an analog clock in the hole, but then didn't really see any value in it. So to clean things up a bit, I sourced a new (NLA) 316i HVAC trim panel that does not have the OBC cutout. I've seen this panel used in several interior pictures of Group A cars, so I figured it was fitting. I also sourced a new turn signal stalk for cars that did not have the OBC from the factory. It removes the ability to push inward on the stalk to cycle through the different OBC screens. It also does not have the "BC" characters printed on the end of it. All this is being done to tie up loose ends after removing the OBC. I like chasing down the little details. Another piece of the puzzle has arrived. These are the instrument cluster PCB connectors that the factory wiring harness plugs in to. Thank you to christsay for tracking down and sharing the connector information. I sourced these from Allied Electronics. 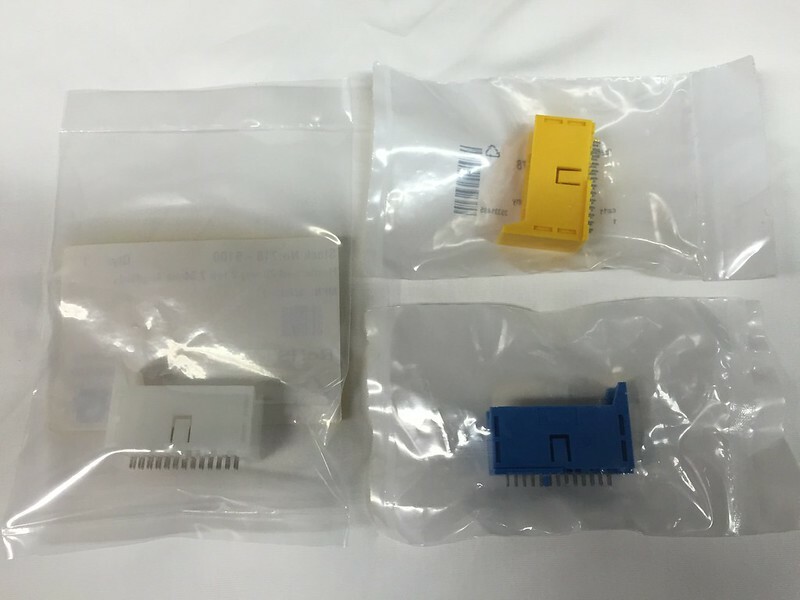 I may be able to get away with not using the -3 connector since I am not keeping the OBC, but I figured I may as well pick one up while I was ordering the others. The next round of parts to arrive should be the 52mm gauges. They are coming from Stack (AutoMeter) and are apparently built to order, so there is a short lead time associated with them. I'm still searching to find suitable indictors for things like turn signals, high beams, etc. I'm not sure if I want to use lights that are plain (unlabeled) or ones that integrate symbology. 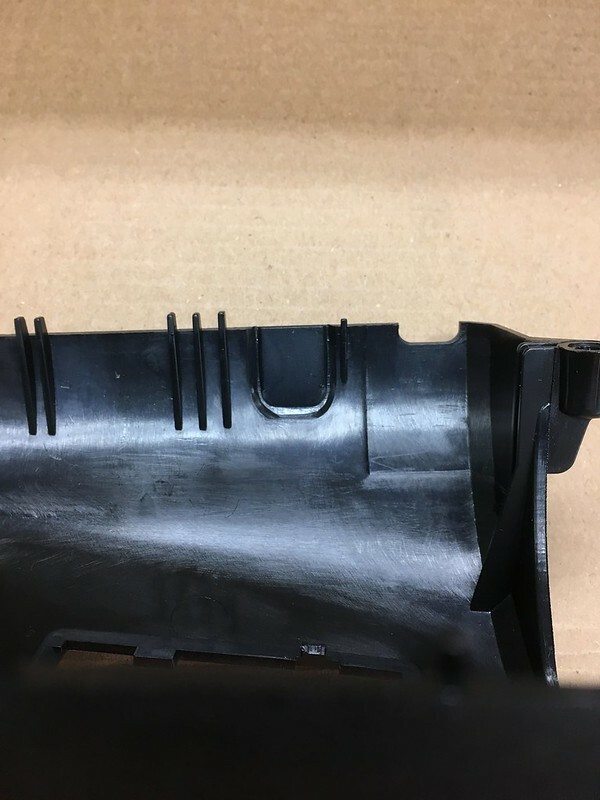 Do you have any info on getting the harness side of these connectors (housing and pins)? 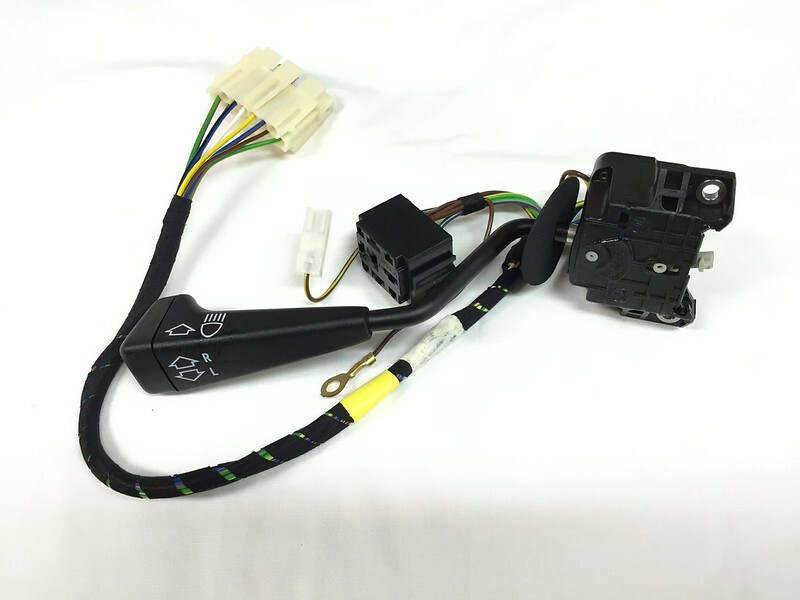 If you call the supplier, they may be able to help you source the mating connector and associated contacts that could be used on the harness side. The 52mm gauges have arrived and I have them laid out in the configuration in which I think they will be installed. They are all Stack Pro-Control stepper motor analogue gauges. I chose these gauges because they all have programmable high and low alarms. True some gauges don’t need both ends of the spectrum, but the capability is there. They will annunciate alarms with both face color changes and triggered outputs. All have through the dial LED lighting. They are pretty dark when not powered on and it made taking a picture a bit difficult. 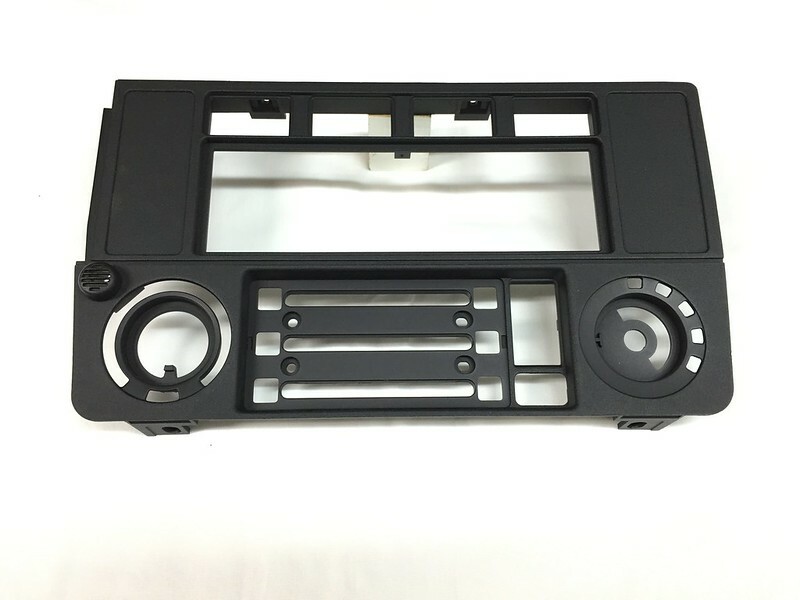 The aluminum gauge panel gets attached to the plastic cover that surrounds the instrument cluster, PN 62111368872. 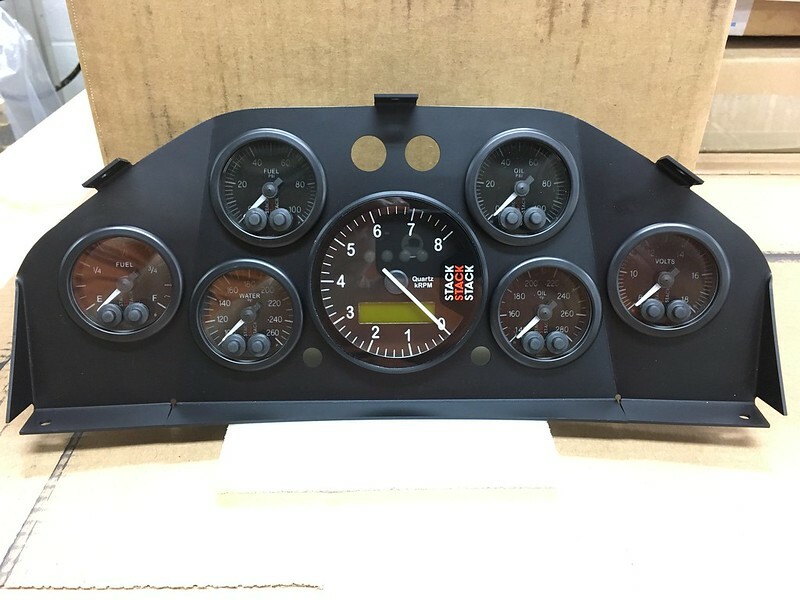 Next, I need to pick up one of these and mount the gauge panel so that I have a clearer understanding of the room available for indicator lights. The problem I have with them is that the illumination was WAY too bright, for me at least, when driving the car at night. There was no way to dim them either. I hope you don't plan on doing any night driving or I think you will find the same. I also don't know if you could wire up a dimmer rheostat that would work on LEDs....I don't think you can. After I received them, I put power to one of the gauges to see how bright the backlight is and also to sample the available colors. I agree, it is extremely bright (even in daylight) and would make night driving difficult. That was a concern I had before buying them. However, these gauges all have two lighting modes, full on or dimmable, that is selectable when in programming mode. In the dimmable mode, you can vary the brightness from full ON all the way to OFF. There is a separate wire you connect to your dash lighting to control the dimming. 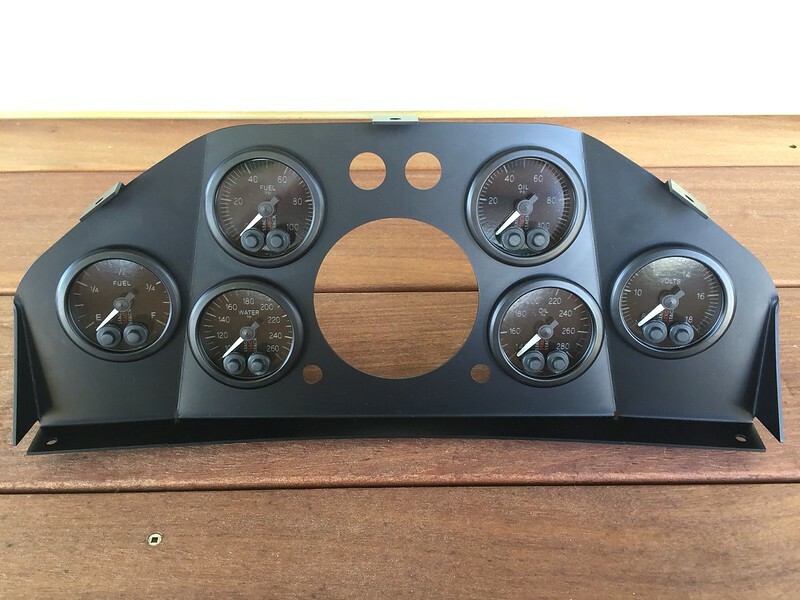 Maybe the design of the Stack gauges has changed from the ones that you have. I have Autometer stepper motor gauges that have been in the car about 10 years now. They have around the dial lighting and were originally equipped with regular light bulbs. I replaced them with LED bulbs shortly after installation and was still able to dim them when connected to the factory dash lighting in the car. Following that with interest...Which speedometer will you use? I love this project, and the detailed nature of your implementation. What will your indicator lights be used for? Turn signals? What about the other 2? Right now I am looking at using one of the Stack ST700SR series of tachometers. They are essentially mini dashes, but the only functionality I am really interested in is having a tachometer and speedometer in a single 80mm gauge. 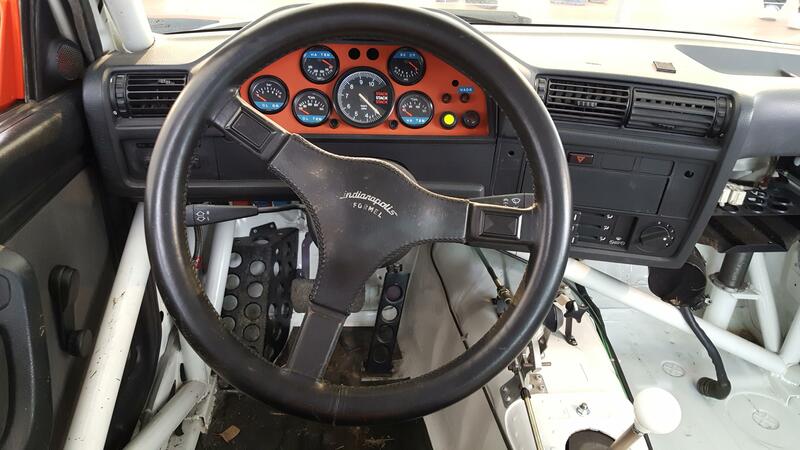 If I had the option, I probably would have purchased the dash panel with the gauge holes cut and no holes for lights. Having to fill the existing size holes makes things a bit restrictive when choosing lights. I haven't settled on the exact number of lights yet. I need to get the panel mounted in the instrument cluster surround to see how much room I have to work with first. The surround does cover up a bit of the panel once mounted. Awesome work. I was at the Rolex Motorsports Reunion and quite a few BMW E30 M3s were out for BMW's Centennial. Took a few of these shots and thought I'd share with you. It's been a while since I've updated this thread. I now have the Stack ST700SR-A display tachometer. I also picked up a new lower trim piece for the steering column. 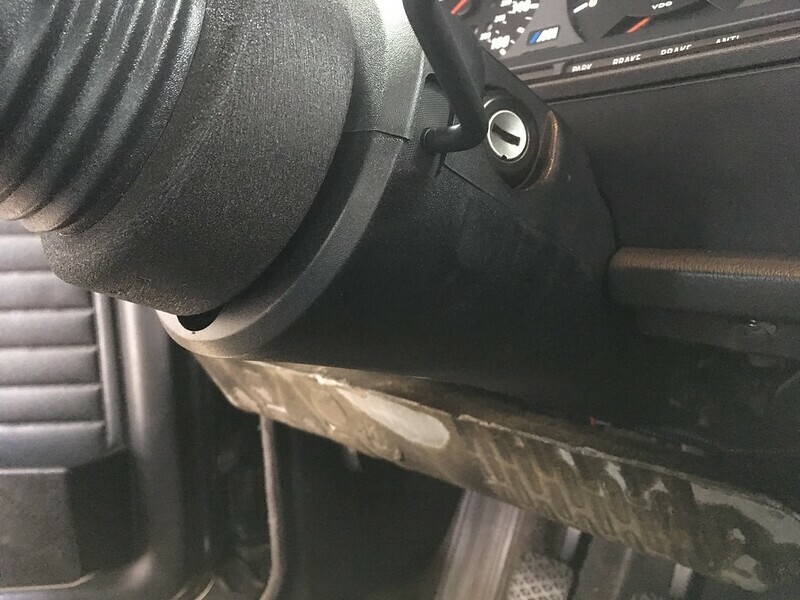 This piece doesn't have the knock out for the cruise control stalk removed, so it will take care of the hole that would have been present after I remove the cruise control system. 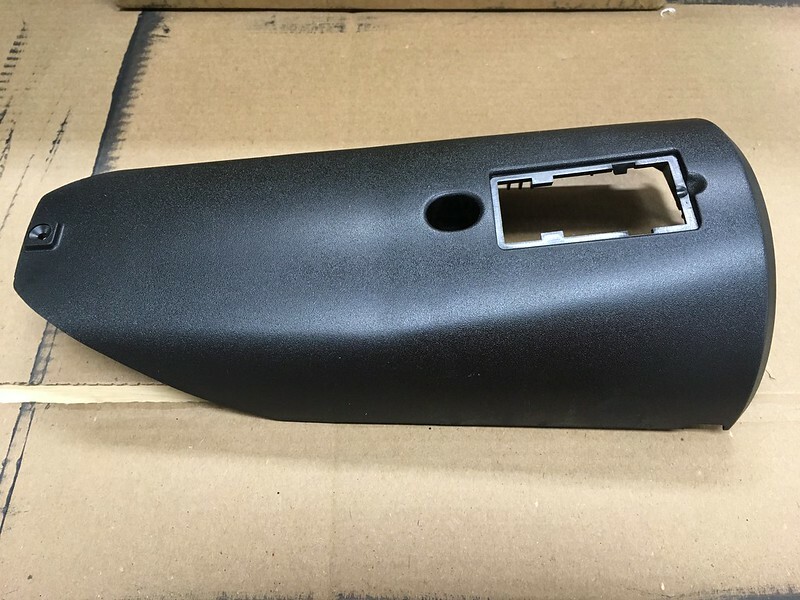 The BMW PN for this trim piece is 32 31 1 156 468. This project is still ongoing, just slowly. I haven't come up with an indicator light configuration for the dash I'm happy with yet, so I've been working on some of the side projects supporting the new dash install. While I had the dash apart for this work, I saw that there should be ample room to install some sort of "break out box" to plug the factory harness C1 and C2 connectors into in order to get the necessary signals to the new dash. I decided to keep the Check Control panel as installed by the factory. I reconnected the system and will keep it active to capture the fluid and bulb fault indications. I decided it wasn't worth the effort or real estate on the new dash to move these indications in front of the driver. 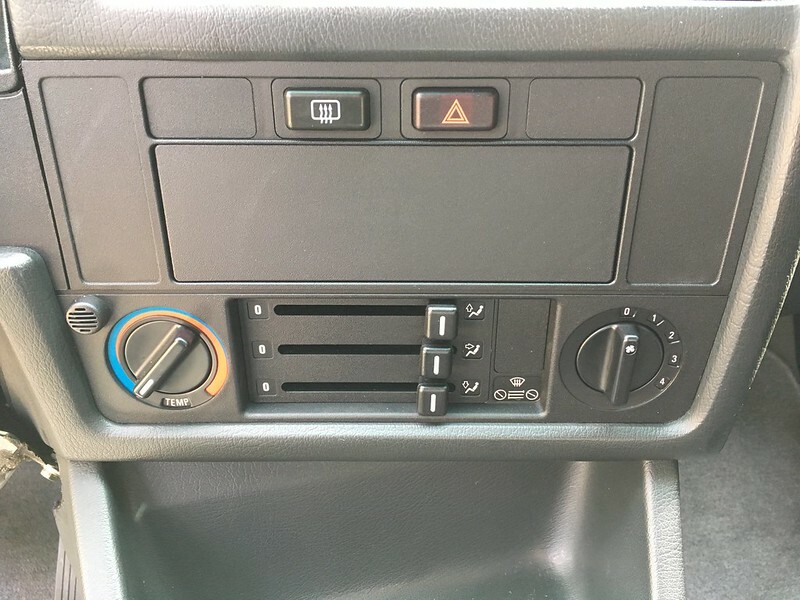 I will install a single light on the dash panel to indicate a need to look at the Check Control panel in the event of a fault, just like the factory setup. Since I lose the speed output that goes to the cruise control when I remove the factory instrument cluster, it renders that system inoperative. As a result, I've removed the cruise control system completely. I installed the new steering column lower trim and it closes up the empty hole where the cruise control stalk was. I installed the 316i HVAC trim panel and removed the OBC. I've also removed all the interior OBC wiring, which included the C3 connector to the stock instrument cluster. The OBC relay box will remain in place for now (unpowered) so that the car will still start. I removed the AC over 12 years ago, so I removed that switch and installed a blanking plate while I was doing the panel installation. The only unexpected part of the installation was that the fan speed knob will now only turn from 0-3 due to the way the knob stop is built on to the 316i panel. I should be able to get around that by trimming the corresponding stops on the knob, but I haven't looked at it that hard yet. 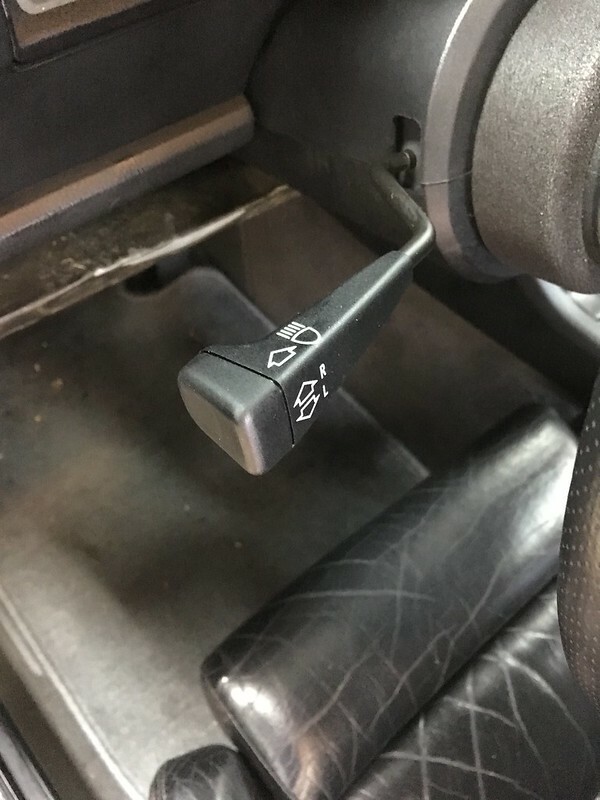 The new turn signal stalk without OBC functionality has been installed. Everything functions as before, you just can't press the stalk in anymore to flip through the OBC screens. For some reason, this stalk was about 1/2" longer than the original stock. After I reinstalled the steering wheel and looked at it, it sticks out past the steering wheel about the same as the windshield wiper stalk and doesn't feel awkward. At first I was concerned, but it was a non issue. Last edited by rewilfert; 04-22-2017, 03:01 PM. Reason: Add details. All times are GMT-12. This page was generated at 01:18 AM.